The puck has not been dropped on the Winnipeg Jets first regular season or pre-season game and already there is competition in their nets. He joins starter soon to be 24 year-old Ondrej Pavelec and 35 year-old journeyman Chris Mason in the quest to be the Jets stoppers. 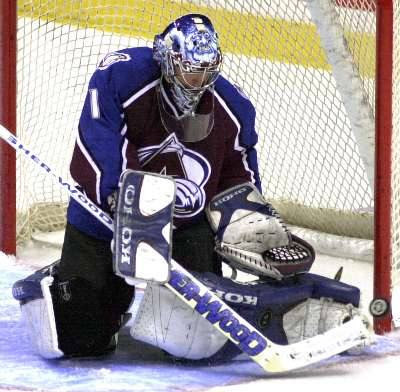 However, Aebischer's chances of making the team and sticking around may be slim to none unless he has regained the play he had in the 2003-04 season with the Avalanche when he went 32-19-9 with a 2.09 goals against average and a .924 save percentage. His downfall came when he was dealt to Montreal in return for Jose Theodore and he struggled mightly before bowing out in the 2007-08 season in North American and going to play for Lugano of the Swiss Elite League. Aebischer has a long hill to climb if he were to even grab a backup position as Mason has become the mentor to a younger Pavelec. Mason has had mixed success in the NHL as well, but has more experience than Aebischer with four seasons of 15 or more wins, including a career high 30 in 2009-10 with the St. Louis Blues. Pavelec is undoubtedly the starter in Winnipeg, so Aebischer's focus would be primarily on grabbing Mason's spot. The big question is if Aebischer would be willing to play in the AHL with the St. John's Ice Caps if he were not to make the Jets. Mason has never made more than $3 million a season, even as a starter in St. Louis, which would perk the question of if the Jets were to sign Aebischer what would he even be worth? Anywhere between $700,000 and $1.5 million would be fair, but his chances as of now are not good to make it that far. However, Aebischer's presence at training camp may be a good measuring stick for all the goalies in the Jets organization. Management has likely brought Aebischer in to see how badly Pavelec, Mason, and even minor leaguers such as Peter Mannino and Edward Pasquale want spots on the Jets or even in the organization. Will time away from the NHL been good for a former #1 goalie? Only time will and can tell.